(Bloomberg) -- President Nicolas Maduro’s Constituent Assembly, stacked with socialist-party loyalists, stripped opposition leader Juan Guaido of his immunity from prosecution Tuesday, as the government ratchets up pressure against the congressman seeking to oust the country’s ruling autocrat. The Constituent Assembly, an all-powerful political body set up in 2017 to bypass the National Assembly, voted unanimously to act on the recommendation of Venezuela’s top court, also packed by and loyal to Maduro. Guaido, the head of the opposition-dominated National Assembly, is accused of inciting violence and lying about his personal finances in addition to ignoring a travel ban, which he breached by leaving the country to drum up support abroad for regime change. 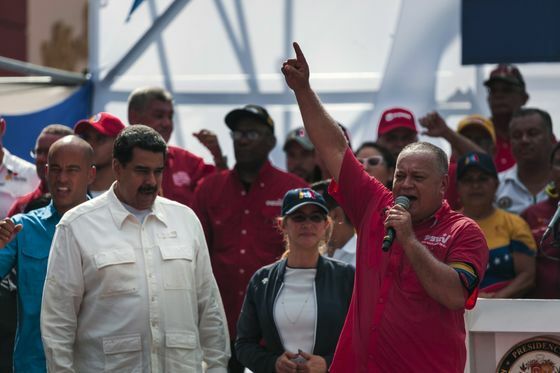 The measure allows Maduro’s chief rival to be prosecuted and potentially removed from office, but it is unclear what affect it will have -- if any -- on his push to bring an end to two decades of socialist rule. Guaido, who’s recognized by the U.S. and some 50 other nations as Venezuela’s legitimate head of state, has dismissed the Supreme Court and the Constituent Assembly as puppet institutions that lack real authority. Authorities opened a probe in January after the 35-year-old lawmaker invoked Venezuela’s charter to launch an interim government and kicked off a wave of national protests after Maduro began another six-year term following 2018 elections that were widely regarded as rigged. The Supreme Court froze Guaido’s assets and prohibited him from leaving the country, but he slipped across the Colombian border in February to tour Latin America and sit down with a half dozen heads of state as he whipped up regional and international support. Guaido’s team says the charges are bogus and that Maduro’s allies are looking to scapegoat a burgeoning protest movement after years of corruption and mismanagement. The oil-rich nation is reeling from hyperinflation, hunger and rolling blackouts that make daily life miserable for residents in backwater towns and major cities alike. Maduro, however, insists, that the country’s woes are not the result of poor governance but sabotage orchestrated by his opponents at home and abroad. The opposition is calling on its supporters to join in another round of national protests this Saturday, following a wave of power cuts and water shortages.